Hoffman was among five jewelry designers from across the country who put their jewelry-making talents to the test in a six-week, elimination-style competition. An extended season finale episode aired on JTV last week. JTV’s Rock Star Designer competition challenged contestants each week in various jewelry design competitions that concluded with an elimination round. One of the judges was celeb stylist Michael O’Connor, who used to do Affinity Diamond shows on QVC. The competition challenges covered creativity, design and business acumen. As the winner, Hoffman will receive a $5,000 cash prize, as well as an exclusive opportunity to work alongside JTV to create jewelry collection that will be featured on the home shopping network. The new JTV collection designed by 2015 Rock Star Designer Ashley Hoffman will be available for purchase through JTV beginning in 2016. To learn more about this year’s JTV Rock Star Designer, visit JTV.com/rockstar. Wedding bells will soon be ringing at Jewelry Television. 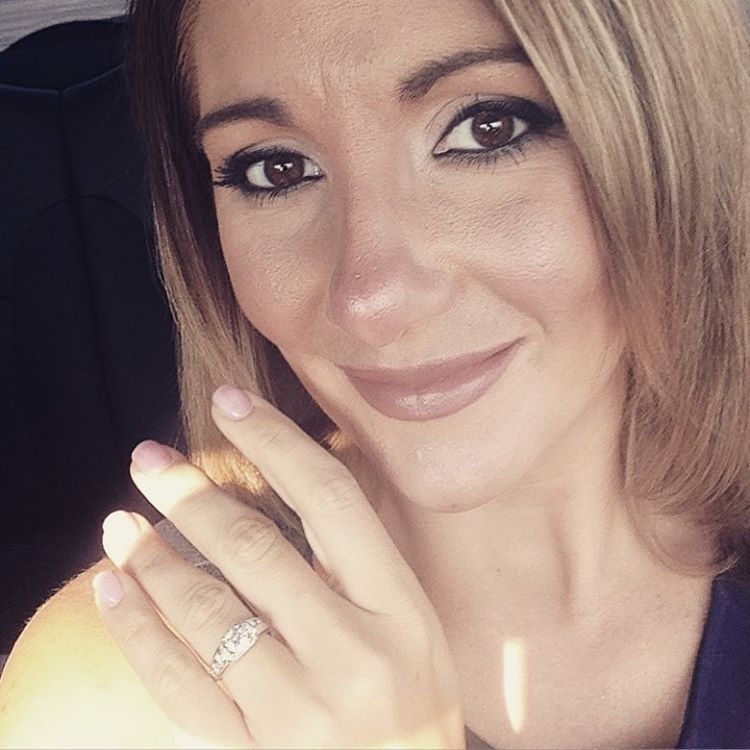 Host Kristen Keech was on the air Thursday when her boyfriend Michael showed up, which must have made her a wee bit suspicious about what was going on. As he pulled her away from her seat — with her protesting that she was barefoot — he broke out a small red box. Do you see where we’re going here? Michael asked Kristen to marry him, and she said yes. She was so excited that she pulled the ring out of the box and put it on her own finger. JTV posted the video on Facebook, and congratulated the happy pair. It is a Moissanite, not diamond, ring. Now that’s loyalty to JTV and vendor Charles Winston. We hope JTV gave Mike a break on the price. Well, the love is sure gone between DirecTV and soon-to-be-shut-down Gems TV. Gems TV made its U.S. debut on DirecTV in November 2006. At that time, DirecTV lauded the network. “[GemsTV’s] innovative reverse-auction format is unprecedented in the history of American television and offers viewers a fun and easy way to shop for high-quality gemstone jewelry from the comfort of their own homes,” said DirecTV EVP of programming acquisitions Dan Fawcett, a straight-up guy who we know from our days covering cable. But that was then, and now is now. Before Gems TV, which is ceasing operations, filed for Chapter 11 bankruptcy protection on Monday, DirecTV had already been in court and won a restraining order barring the home shopping network from taking any action that would leave the channel with less than $25 million in money or assets, until further order of the court. Presumably, DirecTV believes it is owed that same $25 million. DirecTV’s lawsuit has been stayed pending the bankruptcy proceeding, but we got a look at it. Large portions of the suit have been “redacted,” or blacked out. Those include the details of DirecTV’s carriage agreement with Gems TV. The suit charges Gems TV with breach of contract and fraudulent conveyance. Basically DirecTV, which brought Gems TV to 18 million homes, was trying to stop the network from moving all its assets to the Cayman Islands — out of the reach of creditors. In February, Gems TV came to DirecTV and asked to renegotiate their carriage deal, telling the satellite provider that it “was losing money and might be forced to discontinue their programming activity,” according to the suit. DirecTV refused to amend or modify the contract. On March 8, Gems TV gave DirecTV written notice that it was terminating their contract because the network was in fact going black. The satellite company says that’s a breach of contract. She writes that Gems TV will cease operations April 15, and therefore there is no breach of contract. Around this time, DirecTV learned that Gems TV was planning to invest $60 million in Multimedia Commerce Group, which operates Jewelry Television. “Gems TV thus seeks to transfer its assets in a fashion that will leave no assets available to compensate DirecTV for damages caused by Gems TV’s breach of the contract,” according to the suit. The transfer of assets to the Cayman Islands or to invest in JTV “is undertaken in bad faith and constitutes fraudulent transfer,” DirecTV alleges. That investment was a way for Gems TV to liquidate the rest of its inventory, by taking it to JTV, according to DirecTV’s suit. This may all be moot now, to be decided by a bankruptcy judge. In its Chapter 11 filing, Gems TV claims to have $51.2 million in assets and $120 million in debt, all unsecured. The Homeshoppingista took a little R&R Monday with an overnight trip down to Atlantic City with dad, sister Karen, brother-in-law Kent, niece Syndey and nephew Evan. The weather was gorgeous, but since we don’t have a laptop we had to take a siesta from the blog. Now we’re trying to update you on the Gems TV story even though we’re straining our neck to turn around and peek at “Southland” on TNT. But blog duty calls. It seems that while were were strolling along the AC boardwalk Monday, Gems TV was busy filing for Chapter 11 bankruptcy protection in Delaware. Gems TV posted a one-paragraph press release about the filing on its Web site Tuesday. “Gems USA has, after due consideration, determined that the Chapter 11 proceedings is the best exit strategy to adopt to ensure an orderly winding down of its U.S. operations,” the release said. After a tip from a reader, last week we broke the story about Gems TV planning to shut down operations and buy a stake in Jewelry Television. We also wrote that giant distributor DirecTV has filed suit and received a retraining order against the network over $25 million in revenue that the satellite provider apparently believes it is owed. The Wall Street Journal wrote up the Gems TV bankruptcy Monday. For cable insiders, Gems TV’s president is Diane Schneiderjohn, a former marketing executive at Charter Communications. In the bankruptcy filing, according to The Journal, Gems TV is claiming it has $120 million in debt. The network, unlike other home shopping networks, makes its viewers bid for items via what it calls a reverse-auction format. Guess that has not gone so well, and soaring gold prices have also strained the network. The bankrupty filing says that Gems TV has $51.2 million in asets, according to The Journal. The networks employees will join the unemployment line, like us, May 6. Gems TV claims it has 37 million subscribers. Thanks to a tip from one of our fans, we’ve wised up to the fact that financially struggling Gems TV is going black in the United States — and that DirecTV has filed suit against the home shopping channel over its demise. Earlier this month Gems TV’s Singapore-based parent company, Gems TV Holdings Ltd., announced that it was ceasing the network’s operations and buying a 37.8 percent stake in its rival, Jewelry Television, known as JTV. Gems TV will end its operations whether or not its deal to buy into Jewelry Television, whose parent company is Multimedia Commerce Group Inc., closes. The press release also had a statement from Gems TV chairman Jason Choo. In the fiscal second quarter ending Dec. 31, Gems TV saw its product revenue drop 15 percent, to $40.2 million. Gross profit rose 27 percent, to $16.5 million. The loss attributable to shareholders was $6.3 million, down from $18.5 million the prior year. Last Thursday Gems TV announced the satellite provider DirecTV had filed for a temporary injunction against it in U.S. District Court in California. There was also a retraining order issued barring Gems TV from taking any action that will leave the network with less than $25 million in money or assets, until further order of the court. Gems TV said that DirecTV’s claims are without merit and that it will contest them. We couldn’t reach our buddies at DirecTV yet Wednesday morning: They are out in El Segundo, Calif.
JTV will incorporate Gems TV’s reverse-auction program with its existing fixed-price selling programs. You are currently browsing the archives for the Jewelry Television category.